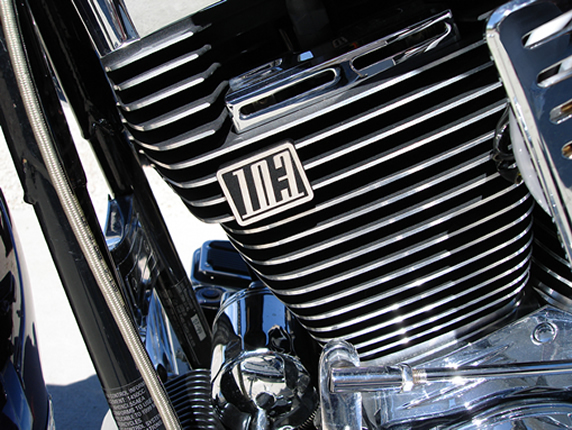 Engine Badges for Harley Davidson Twin Cam Motors. Electraeon Engine Badges are made in the USA from CNC machined 6061-T6 billet aluminum and utilize a special powder coat that is sun light and heat fade resistant. Several styles are available for 88, 95, 96, 103, and 110 cubic inch motors. Fits all 1999 to current Twin Cam equipped models. Engine Badges are easy to install. Simply place the badge on the cooling fins and tighten two allen screws to secure the badge. Top row: Reverse Styles. Middle row: American Classic Styles. Bottom row: Classic Styles. 103 Reverse Style on front left side of motor. 103 Reverse Style on right side of motor. 103 Reverse Style on left side rear of motor.